Tompot Blenny – Distinctive red eyes and red tentacles protrude from its head like a stylish hat. Velvet Swimming Crab – Bright red eyes, bright blue banding on its legs and covered in dark hairs, this aggressive little creature packs a mean punch with its strong pincers. Pipefish – As its name suggests, this fish is long and thin and, like seahorses, the male pipefish carries the young in his brooding pouch. Common Prawn – These are transparent so you can see all their internal organs as they dart around the water in frantic, jerky spasms. Snake–locks Anemone – Bright green with purple tips, this elegant creature has a sting in its tail; its tentacles are used to stun passing fish. 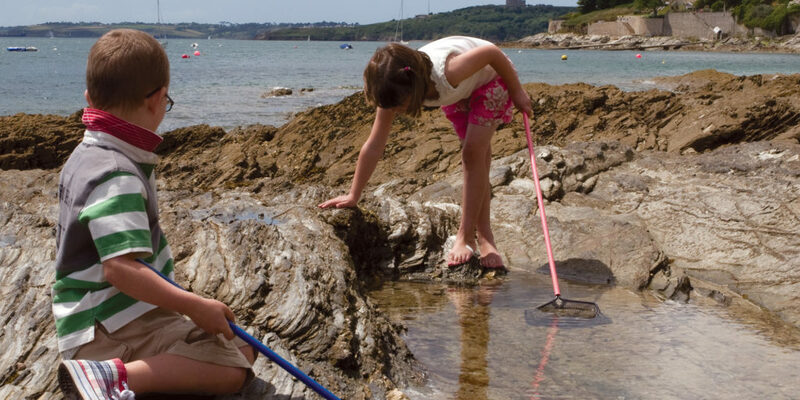 Less well-known than its popular neighbouring beach, Gyllyngvase, Castle beach just along the coast towards Pendennis Castle is the ideal spot for rockpooling, with lots of pools for discovering critters. Recommended by almost everyone with a passion for peering at sea creatures. A wide open bay where at low tide huge rock pools are revealed and the watery shallows are uncovered. Right down on The Lizard, Kennack Sands is a perfect family beach where you’ll find lots of sand, and rockpools aplenty as the tide recedes. Dramatically located on the northwest coast, where high cliffs tower over the pebbles; venture to the far end of the beach, where large crabs lie in wait to be discovered in the numerous pools. St Mawes on the Roseland peninsula is scattered with tiny rockpools, home to an amazing array of fish, anemones and seaweed.